Art+Soul raised the profile of the brand and redesigned the website for Women in Film & Television - Toronto. Member engagement skyrocketed, while bounce rates took a nose dive. Helping clients make a positive impact on the world is one of our favourite things to do. We leapt at the opportunity to help further the mission of Women in Film & Television Toronto–empowering women to succeed in media. 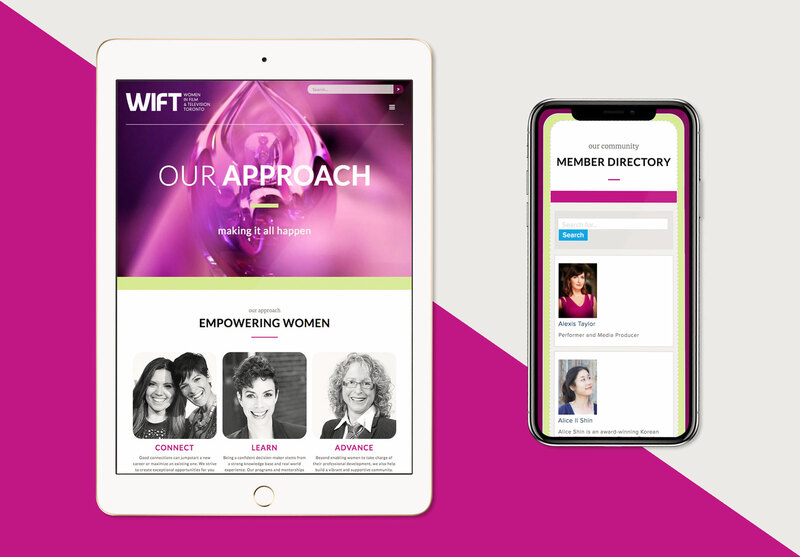 Working with WIFT-T's forward-thinking Executive Director, Heather Webb and Marketing Manager Kadon Douglas, Art+Soul redesigned their website. The result was a contemporary look with streamlined content, overflowing with images of real members and playful illustration. The redesign lead to membership rebounding, decreased bounce rates and skyrocketing member engagement. The experience was streamlined by letting members self-select the content relevant to their career stage. To draw and maintain attention, Art+Soul worked with the WIFT-T team to deliver a virtual smorgasbord of lively visuals, compelling copy, and charming illustrations–including likenesses of staff, members and donors. To increase donations and encourage member engagement, Art+Soul introduced the concept of "Fuel the Change." Inspirational stories were shared of members who donate to WIFT as a form of paying forward the career benefits they have gained through membership. Art+Soul noted that many "early career" members may not in a position to make donations yet, so we implemented a list of ways to get involved and make a difference that went beyond donations.